• Use only high-quality CD-R or CD-RW discs labeled for audio use. • Use only CD-R or CD-RW discs on which the recordings are closed. • Play only standard round-shaped CDs. • Some software files may not allow for audio play or text data display. • Some versions of MP3, WMA or AAC formats may be unsupported. Follow these precautions when handling or storing CDs: • Store a CD in its case when it is not being played. • When wiping a CD, use a soft clean cloth from the center to the outside edge. • Handle a CD by its edge. Never touch either surface. • Never insert foreign objects into the CD player. • Keep CDs out of direct sunlight and extreme heat. 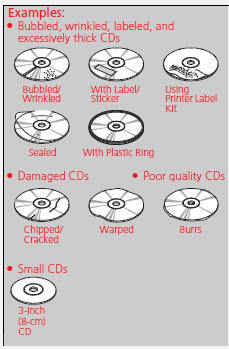 • Do not place stabilizer rings or labels on the CD. • Avoid fingerprints, liquids, and felt-tip pens on the CD.